From the creators of hit franchises such as Despicable Me & The Secret Life of Pets, comes this live-action meets state-of-the-art-animation holiday favorite Hop. 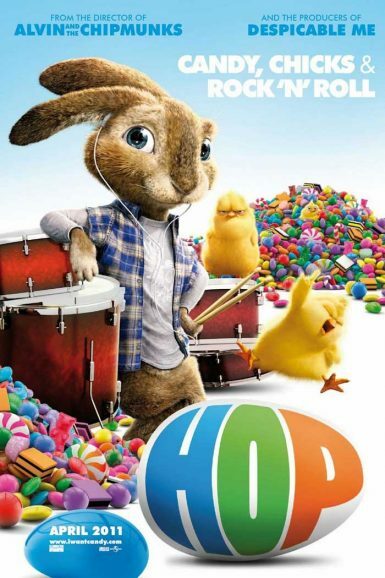 With his father’s expectations weighing down on his furry little shoulders, the Easter Bunny’s teenage son (E.B., voiced by Russell Brand) runs off to Hollywood to chase his dream of making it big as a drummer. There he teams up with an out-of-work slacker, Fred (James Marsden), and together they go on a hilarious series of misadventures, culminating in a Battle For Easter, which teaches them both the importance of family and what it takes to finally grow up.